Among your colleagues, counterparts, or community people, there may be a chance to have training workshop for thinking about roles of outsiders. The following tips may help you to have such workshops or seminars where the participants will be able to review their activities and to find out appropriate approach to community development as outsiders. The article shown in the previous pages of this newsletter can be a reading material for the workshop or seminars. Try to look back your community as much as possible. When did the community people start living there? What were the important events or happenings occurred in the community throughout its history? Who were involved in those events or happenings, and what were the actions taken by the community members in response to such events or happenings? It can be easy for the participants to make a chronological table of the community. “What happened” “Who are involved” “What was response of the community” are the items that should be reviewed in each event or happening. It is advisable that the participants should choose one community where at least one of the participants lives and know the history. This exercise can also be taken place in a community where various community members are invited to think together. To recall the memory of a community, and to find out how the community people themselves acted and reacted in each event or happening with their own initiatives. Choose any one of community development projects that the participants are involved. Review all the activities in the projects from the beginning until the present time. Try to find out whether community people start something by themselves in relation with the project activities. If there are such cases, look into the details of the actions. In which circumstances, community people took initiatives to take part in the project? In this exercise, the participants have to find out the cases where the community people took real initiative to do something. In development projects, there might be various opportunities for the community members to “participate in” the ready-made activities already designed by outsiders. But those are not the things we need to find out in this exercise. In the projects, there might be a time when the community people themselves took initiatives to do something without being instructed or even without any support from the outsiders. We need to explore the process of those actions. To review community people’s actions within a development project and to analyze the process and background of community’s own initiative. Among various knowledge or skills, please categorize them into the following matrix. Try to find out concrete examples of knowledge and skills that can be fit to each category. It is advisable to find out 5 to 10 items for each category (box) in the matrix. To become aware of difference between outsiders and community people, to understand that there are many things that the community people know but the outsiders do not know, and to find out the reasons why the outsiders need to be involved in community development. Choose any one of issues that you think important for a community. Try to list up the good points that will be emerged if the community people can solve the issue (at least 30 points). Then, categorize the points according to “for whom the point is good”. The issue can be taken from any kinds of sectors. The point of the exercise is to find out good points as many as possible. At first, you may find out a few good points mainly for the “beneficiaries” themselves. However, if you try to find out more and more, you will be able to understand that the issue is not only for the target community people, but also for the outsiders as well. To become aware that an issue of a community can also be an issue for the outsiders, and to understand that there is another reason why outsiders need to be involved in the community other than only for the beneficiaries themselves. Some of the participants can answer that “it is M”, but some others may say “it is W”, “it is E”, “it is 3”, or even “it is mountain” “it is a breast of a woman”. All the answers are right. 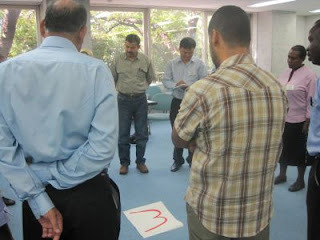 However, if a participant who stands in front of you answers that “it is M”, then, you should ask him / her “is it true?” “From your standpoint, is it really M?” Then, the person may understand that he / she see the letter not from his / her own standpoint but from the facilitator’s standpoint. Then, you can explain that in many cases of community development, the community people will answer to your question from your (outsider’s) standpoint or viewpoint, not from their own standpoint. You can ask the participants why the community people may respond like this. To realize different standpoints between community and outsiders, and to be aware that despite the different viewpoints, the community people tend to tell the things from outsiders’ point of view, as a result, it is not easy for the outsiders to know the real view of the community people. Try to list up actions as many as possible that can be taken by the outsiders in order for them to construct partnership with the community members. There should be more than 30 points. After listing up the actions, the participants can be asked to categorize them. There might be formal actions and informal actions. There may also be various actions taken with various types of community members. To think about partnership building, to find out that there are many actions that the outsiders can do in informal ways. Choose any one of communities, visit it, and walk through a part of the community area. Try to pick up FACTS as many as possible. After coming back from the community, make hypothesis based on FACTS found there. It is advisable that the participants are asked not to interview to the community people. This is an exercise for conducting effective observation. The facilitator may give some hints of observation such as “focusing on natural resources”, etc. In the hypothesis making, please be careful not to confuse facts with hypothesis. It should also be noted that a hypothesis can be made from more than two facts, or on the contrary, from single fact, various hypothesis can be made. To experience observation, to realize difference between FACTS and Perception (hypothesis), and to learn how to make hypothesis based on FACTS. Make pairs among the participants. One person will ask questions to his / her partner. The topic of interview can be related with the participants’ everyday life, such as “what is your most urgent problem in recent days”. Instruct the participants that they have to use only the questions that ask FACTS. The form of questions can be with “what” “who” “when” or “where”, but try to AVOID using “why” or “how” as those two question words ask the perception of respondent. By not using why or how, and exploring only the facts, the interviewer is requested to find out the real problem that his / her partner faces and its causes. To experience interview, to be accustomed with using FACT finding questions, and to learn how to explore facts in order to find out issues.